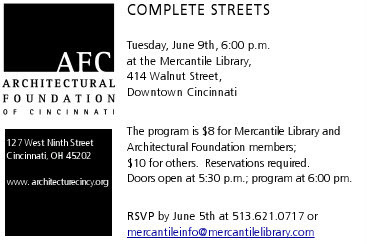 Tuesday, June 9th at 6pm,...Roxanne Qualls will be (at the Mercantile Library) to discuss Complete Streets...with planner Clete Benken of Kinzelman Kline Grossman. 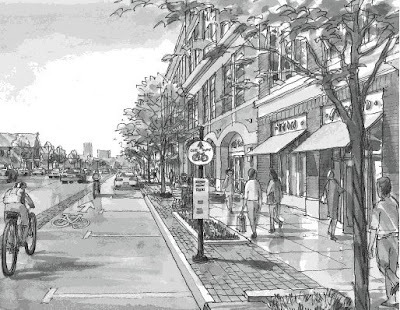 ... Mr. Benken will be here because his firm is in the street fixing business and is responsible for the plan that will restore two way streets to Lexington, so he may have a few things to say about Cincinnati’s vehicular sewer system. It’s going to be great. Worth every one of the eight dollars to be charged. You’ll need a reservation by tommorrow, Friday, June 5th....513 621 0717. Dang...I didn't even realize you posted this. Great minds think alike I guess...yours just a day faster than mine. Thanks Mainstream Media... for nothing.